Since we registered with Pack for a Purpose in May last year, the Flatdogs Camp has enjoyed a steady stream of supplies from all over the world! Most guests bring a few work books or pens and pencils, but some have brought suitcases full of everything from calculators to science books! In total, we’ve received about 25kgs of donations!! A group from the University of Washington carried about 15kgs of equipment all the way from Seattle, and a family from England gave us all their treasured childhood story books. We are very grateful to all donors, whether they brought whole suitcases or a couple of books squeezed into the last little space in a rucksack. Thank you! 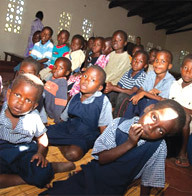 Project Luangwa is the umbrella organization which oversees our community projects in this area. Through them, we give supplies to Chiyembekezo Pre-School, which provides education to some of the most vulnerable children in the area, and to Mfuwe Basic School, a local primary school which currently has 1,400 student on its register!! It is wonderful to see the children enjoying the toys and books, and many classroom walls have been brightened up with colorful educational posters. So, wherever you are going, check the PfaP website and see if there are any initiatives that need your help…then look carefully at your suitcase, and I’m pretty sure you can find space for a few extra items that would make someone’s day at your destination. It’s a small effort, but can really make a difference.